I found this recipe in my files, and apparently, I put it there back in 2006. 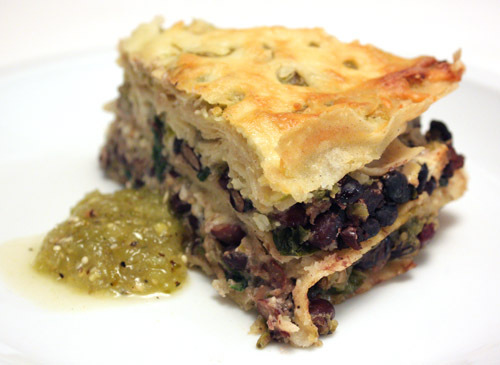 It’s from Living magazine, and it’s similar to other tortilla and bean layered casseroles I’ve made. It’s a versatile dish in that you can easily substitute ingredients here and there, but it is important to keep the moisture content as intended so the casserole doesn’t become soggy and so the cut pieces will hold their shape. I wasn’t able to find this exact recipe on the web site, so I’ll list it below, but there is a similar dish in the Everyday Food cookbook. 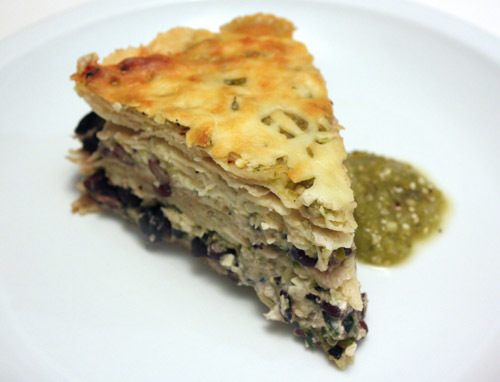 In that book, it’s called tortilla and black bean pie, and it's a little different from this one. For this version from the magazine, you make a salsa verde which is layered with roasted poblanos, toasted tortillas, black beans, spinach, and cheese. You could save some time by purchasing pre-made salsa, but I had some green tomatoes and chiles to use from my CSA. The suggested method in the recipe involves sauteing onion, garlic, and tomatillos before adding chiles, but I prefer to place all those things with green tomatoes on a baking sheet and brown them under the broiler. Once browned on all sides, everything is pureed in a food processor with lime juice and cilantro. For the casserole, corn tortillas were cut in half, brushed with oil, and toasted in the oven. They’re removed before they become crunchy, but they do become sturdier. Spinach leaves were cooked and drained, onion was sauteed with chopped roasted poblanos, and the black beans were cooked with garlic. I used a spring-form pan, and the first layer was 12 halves of tortillas which were overlapped in the bottom of the pan. Next, the poblano and onion mixture was added followed by half of the black bean mixture. That was topped with sour cream, since I forgot to buy Mexican crema, and then some salsa was added. Shredded monterey jack cheese was added, and then the layering was repeated with spinach instead of poblanos. Last, the casserole was topped with the remaining tortilla halves, salsa, and cheese. I was surprised at how easily the spring-form ring was removed, and how easily the casserole was cut. It’s a dry enough mixture that there’s no danger of the layers sliding apart as each piece is plated. Now that I’ve looked at the other casserole in the Everyday Food book, I see it includes corn and green onions. Not that the version I made seemed lacking at all, but those will be great additions when I make this again. -Preheat oven to 425 degrees F. Brush cut tortillas on both sides with vegetable oil and place on two large baking sheets overlapping as needed. Bake for six minutes and rotate pans after three minutes. Set aside. -Wash spinach and drain. Heat a large skillet over medium heat and cook spinach briefly just until wilted. Season with salt and pepper and transfer to a colander to drain. Heat two tablespoons oil in skillet, add onion and saute until translucent. Add chopped poblanos, cook until heated through, and transfer to a bowl. Heat another two tablespoons oil in skillet and add garlic. Cook for 30 seconds and add black beans. Season to taste with salt and pepper and cook until heated through. -Line bottom of a 10-inch spring-form pan with 12 overlapping tortilla halves. Add poblano mixture, top with half the bean mixture, add one half cup of sour cream, and pour 3/4 c salsa on top. Spread 1/2 c shredded cheese on salsa. Repeat layers a second time using spinach instead of poblanos. Top casserole with remaining tortilla halves, salsa, and shredded cheese. -Place spring-form pan on a baking sheet and bake until heated through, about 45 minutes to one hour. Let stand for 15 minutes before removing spring-form ring and serving. Serve with additional salsa. Oh yes, I will be making this next week for sure once Randy is back from NYC. YUM! Fantastic on a cold winter's night... I adore anything with Poblano peppers and black beans! This looks seriously amazing! I made a mexican casserole the other night, but it looked like a big blob of cheese and chicken and tomatoes - not nearly as impressive as yours! fabulous pictures. we've made a version of this that wasn't even close to as tall or delicious! I agree with Chef Fresco... I've seen similar recipes but this one has style. I have to say that this phrase in your post - "I've found this recipe in my files and apparently I put it there in 2006"
A gorgeous casserole! I love those flavors! This look soooooo good. I've never seen a "totrilla casserole" before, but it is truly a thing of beauty! Waw,....this meal loooks so goood to me,....Just so aparet & nice! I'll have to try this for my family instead of the chicken enchiladas I always make. Do you think it can be made several hours ahead, then baked? Lynnlu: Yes, I forgot to mention in the post that I did prepare this in advance and store it in the refrigerator for a couple of hours. Just bring to room temperature while the oven pre-heats. i love absolutely everything about this dish, and i'm ELATED that you posted the recipe. this could possibly top apple pie as the pie-of-all-pies in my book. What a innovative casserole! It must have tasted heavenly! My mouth is watering! And a fun way to serve it- like a slice of pie. My god I miss Texas. It's gorgeous and sounds really delicious, excellent recipe! Wow, this is the first time I see a tortilla casserole but it sounds delicious, if only I could get some of these ingredients. Oh man, how perfect is that?! Anything with roasted poblanos and I'm sold! I haven't yet invested in a spring form pan, this is just the little push I needed. This looks too pretty to be tortillas. It looks more like a fancy french pastry! 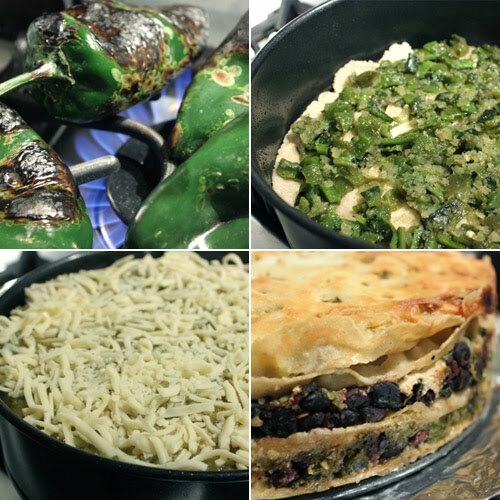 Oh my, another recipe that looks so tasty, I love poblano chilies and black beans - the perfect combination. This looks so good! I love stuff like this! Now this is my kind of casserole! It looks so yummy with all those black beans! The layers are great. Looks hearty. Looks wonderful- this is one that my family would eat and enjoy! Nice! Huge fan of creative ways to eat the food I normally gravitate to. Looks good! I do something kind of like this, but often have some "mush" problems. I'm going to try this version and see what the right moisture content should be.